Kumasi is a city in Ghana and the capital of Ashanti. 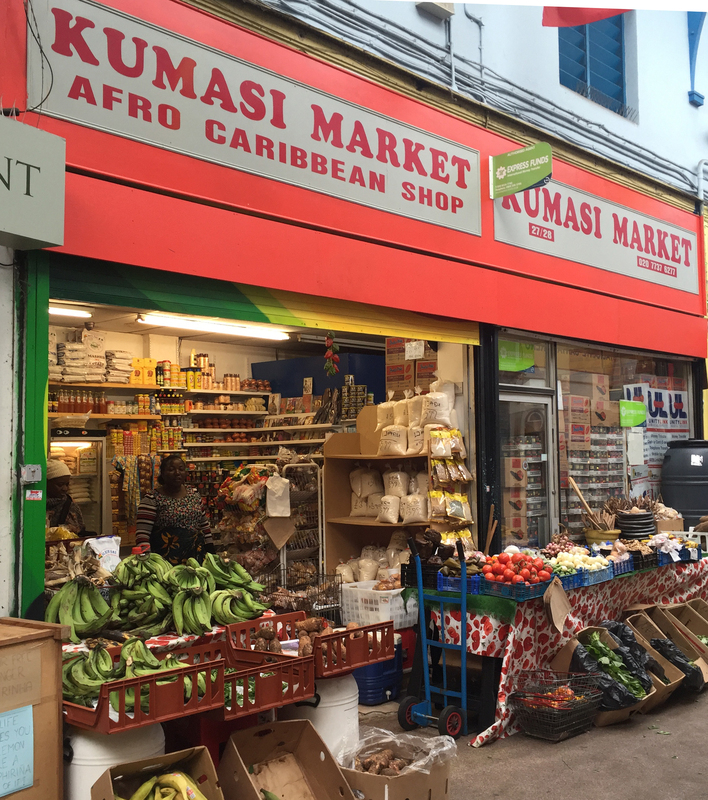 It gives its name to Kumasi Market in Brixton Village, one of a trio of stores in Third Avenue selling mainly food and goods from West Africa. Together with the African Queen Fabric store, it’s like a little bit of Africa in the heart of Brixton. I have intended for some time to cover one of these stores in our series of posts on food shops in Brixton but I always found them a bit daunting. The dried and smoked fish is particularly exotic. However, I’ve occasionally chatted to the shopkeepers, and found that they are really helpful in explaining what they have on offer. So, the intention in these posts is to buy the ingredients at a Brixton store and to make a typical meal. As we have reported before, we have been to Ghana and enjoyed the Ghanaian food at May Foods – see the report here – but this has been my first attempt at actually cooking the food. It has been more of a challenge, as many of the key ingredients are less familiar to those of us with a European background. This is particularly true of the key part of any true Ghanaian meal, the carbohydrate. The dish I’ve gone for is chicken in peanut sauce served with banku and spinach. I’ve used an amalgam of different recipes. 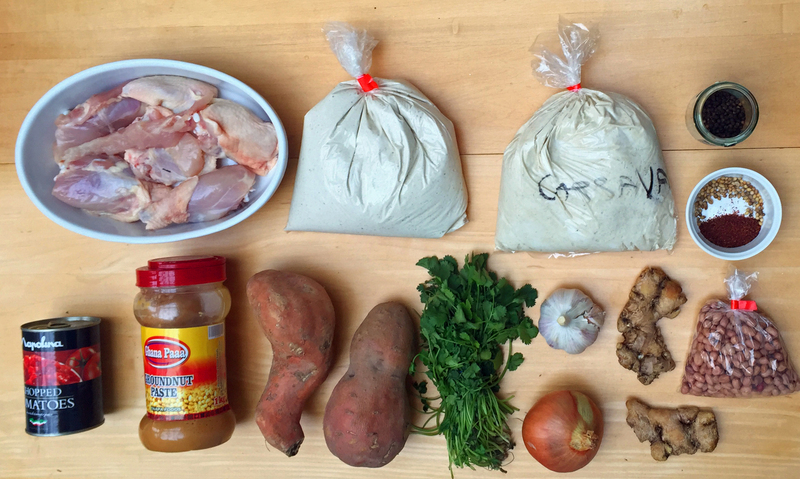 All of the main ingredients have come from Kumasi Market, apart from the chicken which came from Jones the Butcher. The first step is to brown the chicken and put to one side. Then fry the onions, adding the spices when it has softened. 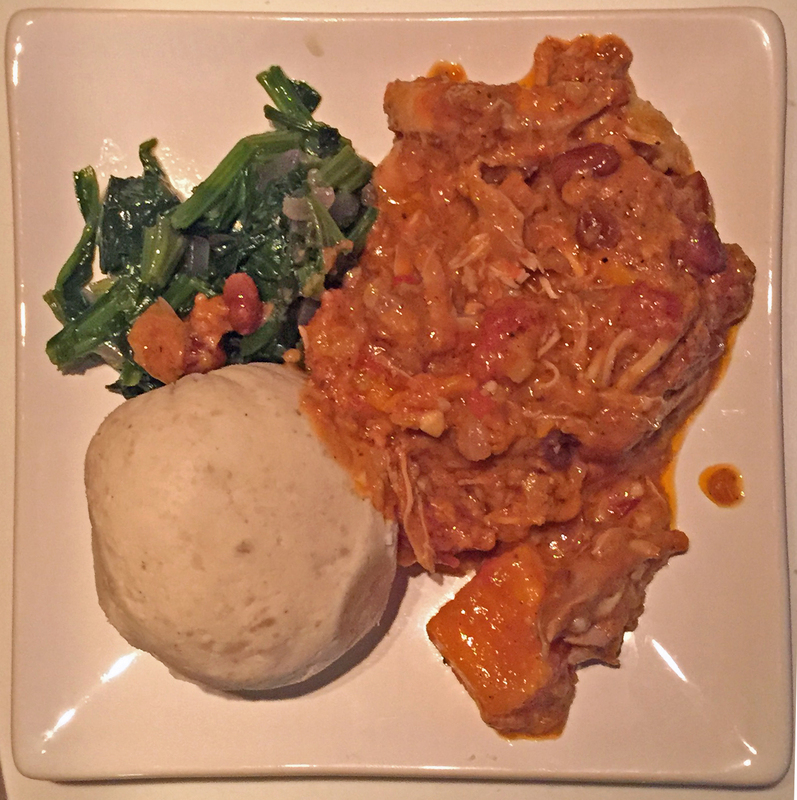 Finally you put everything in the same pot and stew until the chicken and sweet potato is all cooked – check after an hour. After it cooled a bit I removed the bones but this is a matter of taste. The finished article probably benefits from being left to stand for a while, before reheating. You can garnish with lots of coriander. The accompaniments were banku and spinach. The banku is balls of fermented dough and takes a bit of getting used to, as well as being hard work to make. I did make my own, with a mixture of readymade cassava and corn dough bought from Kumasi and it was an education in itself. However, my tip is to buy it readymade from May Foods in Market Row. It should also be understood that the term spinach applies to almost any green leaves. I just chopped and washed mine and fried it in garlic infused oil. Everyone enjoyed the chicken and spinach but views were mixed on the banku. We found a little goes a long way. It would be good with rice of course.